Inland Empire - Today, in a presentation before the Inland Empire Utilities Agency (IEUA), the Sanitation Districts of Los Angeles County declared that the automatic water softener ban and removal program implemented in the area of Santa Clarita over the past two years was clearly successful. The Santa Clarita automatic water softener ban was approved by a public vote in 2008 to help reduce the amount of salt discharged to the Santa Clarity Valley Water Treatment System and released into the Santa Clara River. With the implementation of the automatic water softener ban and removal program, the chloride discharged by existing water softeners was reduced significantly. This represented a potential savings of more than $110 million to the residents of Santa Clarita in comparison to installing expensive salt removal technologies at the sewage treatment plants. "This is very helpful information and we appreciate learning how well the water softener ban worked as IEUA and our cities consider how to deal with the salt impacts to water supplies caused by the home use of automatic water softeners in our service area," said IEUA Board President Terry Catlin. "IEUA currently offers a rebate program to homeowners who want to remove their automatic water softeners. Homeowners can receive up to $2,000 for qualifying water softeners, and the removal service by a professional plumber is free. For more information on how you can take advantage of the rebate, visit www.ieua.org." continued Catlin. "Most people don't know that automatic water softeners - the type homeowners have to buy bags of salt for - pose a major threat to our water supplies because of the huge amounts of salt they discharge into the sewage treatment system" said IEUA Board Member John L. Anderson. "It's a big water quality problem especially for places like the Chino Basin where we depend upon our groundwater and recycled water supplies to meet our water needs," said Anderson. "Just one of these home systems will use an average of 30 pounds of salt per month - that's over 360 pounds of salt per year!" declared IEUA Secretary/Treasurer Michael Camacho. "When you multiply that much salt by thousands of households with automatic water softeners, we have a big pollution problem, especially here in the Chino Basin where 70% of our water supplies come from local sources," continued Camacho. Because of the need to protect local water supplies, every major source of salt within the Chino Basin is currently regulated with the exception of the discharge from home use of automatic water softeners. Last fall, Assembly Bill 1366 was signed into law by Governor Schwarzenegger to provide cities and water agencies authority to regulate discharge from home water softeners in areas where the regional water quality board has determined that there is a particular salinity problem. IEUA is considering the development of an ordinance that will encourage the use of alternative water systems that do not pollute and ban those that do. "We have been working to reduce salts and protect our water supplies in the Chino Basin for decades," said IEUA Board Member Gene Koopman. "Our cities and water agencies have invested hundreds of millions of dollars over the past ten years to protect the quality of our water. If the water becomes too salty, it is tremendously expensive to remove enough salt to make it useable - it would be 10 to 20 times more than the five bucks per bag of water softening salt that a homeowner may be paying today. That's why we are considering all options for reducing the salty discharge that comes from automatic water softeners," said Koopman. "We've already removed over 200 water softeners through the rebate program - that's keeping 72,000 pounds of salt per year, equivalent to 1,800 bags of salt out of the water supply," said IEUA Vice President Angel Santiago. "Homeowners can install alternative systems that don't discharge the salt, including the softeners that use the off-site regenerated exchange cylinders that can be traded out as needed; and the salt disposed of without harming our water supply," continued Director Santiago. "Successful automatic water softener control programs , like the ones being implemented in Santa Clarity, are really important to the long term protection of our water supplies," declared President Catlin. "We're doing our homework to develop a program that will deliver equal success for the protection of our water supplies." The Inland Empire Utilities Agency is a municipal water district located in western San Bernardino County, California. The Agency's mission is to supply imported drinking water and recycled water, to collect and treat wastewater, and provide other utility-related services to the 850,000 residents living within its service area. For more information contact Sondra Elrod at (909) 993-1747 or visit IEUA's website at www.ieua.org. The Chicago summer heat has many people and animals searching for unique ways to cool off, and water is the go-to source in these hot months. However, water temperature and quality should be considered when balancing your dog’s health. The Brookfield Zoo recently used large blocks of ice to cool polar bears and other animals down in the heat, but giving ice or very cold water to your own pet can cause stomach cramps for up to an hour after drinking. This can happen to any pet at any time, but is more likely after exercise or when the temperature rises. Of course you want to give your pet cold water to help its body cool down, but just be sure to avoid an extreme temperature. Another important factor to look out for is the quality of the water. Janet Domrase, owner of Alden’s Kennels in Ringwood, Illinois, recently lost power for a week after a powerful thunderstorm damaged her property. She was completely cut off from her water supply and had to search elsewhere to find water for the pets in her care.“They didn’t like the water. They would drink our purified well water, but the other sources from which I got water tasted differently, so they wouldn’t touch it,” said Janet, who purchased bottled water for the dogs and cats at her kennel. Pets can often suffer if the water quality is off, even if it is simply a matter of taste. Just a small amount of arsenic, lead, water softener salt or other minerals can bring on specific symptoms and diseases in pets that can easily be blamed on an incorrect cause because most people don’t think of their water source as the culprit. Additives for your pet’s diet to protect from water quality-based problems include colloidal silver, to boost immunity and chlorophyll, to enhance energy. Colloidal silver tends to be easier for pets to tolerate because it is a tasteless substance; as many as fifteen drops of the alcohol-free product can be added to your pet’s water. Chlorophyll, on the other hand, may or may not have a slight taste depending on the product you purchase. Several drops of this substance should help to increase energy on hot days. Balancing the body in hot weather can be a tricky task, but starting with clean, fresh water is one of the most important factors in caring for your pet’s health. So, just as long as you make sure that clean water is at a nice, cool temperature, you and your pet will be lounging pool side, beating the summer heat in no time. NEW YORK .Regulatory and water system data analyzed by The New York Times show that more than 49 million people in the US have consumed polluted drinking water since 2004, according to a report in the December 8 print edition of The New York Times. Pollutants of concern included concentrations of chemicals like arsenic or radioactive substances like uranium, as well as bacteria often found in sewage, the report said. Analyzing data from the US Environmental Protection Agency (EPA) and other regulators and water systems, the New York Times reported: .More than 20 percent of the nation.s water treatment systems have violated key provisions of the Safe Drinking Water Act over the last five years, according to a New York Times analysis of federal data.. Fewer than 6 percent of the water systems that broke the law were ever fined or punished by state or federal officials. According to the article, which quoted current and former EPA enforcement officials who wished to remain anonymous, federal regulators were informed of violations, but in many cases, unless the violations would make sensational news stories or target big money, pursuing the violations were overlooked. EPA spokeswoman Adora Andy, in response to questions regarding the agency.s drinking water enforcement, told the New York Times: .This administration has made it clear that clean water is a top priority. The previous eight years provide a perfect example of what happens when political leadership fails to act to protect our health and the environment.. The article also noted that drinking water chemicals .are linked to millions of instances of illness within the United States each year.. This Los Angeles reservoir contained chemicals that sunlight converted to compounds associated with cancer. The city used plastic balls to block the sun, but nearby homeowners asked why, if the water didn't violate the law. The 35-year-old federal law regulating tap water is so out of date that the water Americans drink can pose what scientists say are serious health risks . and still be legal. Only 91 chemicals are regulated by the Safe Drinking Water Act, yet more than 60,000 chemicals are used within the United States, according to Environmental Protection Agency estimates. Government and independent scientists have scrutinized thousands of those chemicals in recent decades, and identified hundreds associated with a risk of cancer and other diseases at small concentrations in drinking water, according to an analysis of government records by The New York Times. Other recent studies have found that even some chemicals regulated by that law pose risks at much smaller concentrations than previously known. However, many of the act.s standards for those chemicals have not been updated since the 1980s, and some remain essentially unchanged since the law was passed in 1974. Dr. Pankaj Parekh, director of the water quality division for the City of Los Angeles, has faced such criticism. The water in some city reservoirs has contained chemicals that become likely cancer-causing compounds when exposed to sunlight. Then complaints started from owners of expensive houses around the reservoir. 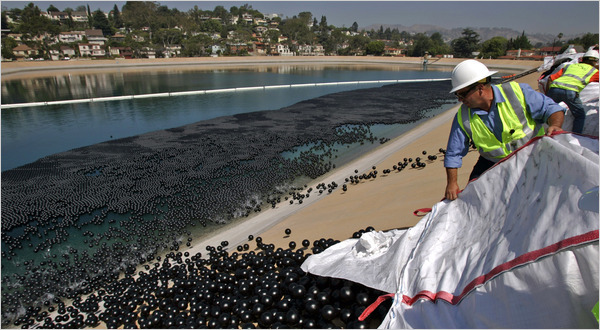 .They supposedly discovered these chemicals, and then they ruined the reservoir by putting black pimples all over it,. said Laurie Pepper, whose home overlooks the manmade lake. .If the water is so dangerous, why can.t they tell us what laws it.s violated?. Dr. Parekh has struggled to make his case. .People don.t understand that just because water is technically legal, it can still present health risks,. he said. .And so we encounter opposition that can become very personal.. Drinking water that does not meet a federal health guideline will not necessarily make someone ill. Many chemicals are hazardous only if consumed for years. And some researchers argue that even toxic chemicals, when consumed at extremely low doses over long periods, pose few risks. Others argue that the cost of removing minute concentrations of chemicals from drinking water does not equal the benefits. A bottled water ban in S.F.? More than 20 percent of the nation.s water treatment systems have violated key provisions of the Safe Drinking Water Act over the last five years, according to a New York Times analysis of federal data. Studies indicate that drinking water chemicals are linked to millions of instances of illness within the United States each year. On Tuesday, the Senate Environment and Public Works committee will question a high-ranking E.P.A. official about the agency.s enforcement of drinking-water safety laws. The E.P.A. is expected to announce a new policy for how it polices the nation.s 54,700 water systems. .This administration has made it clear that clean water is a top priority,. said an E.P.A. spokeswoman, Adora Andy, in response to questions regarding the agency.s drinking water enforcement. The E.P.A. administrator, Lisa P. Jackson, this year announced a wide-ranging overhaul of enforcement of the Clean Water Act, which regulates pollution into waterways. .The previous eight years provide a perfect example of what happens when political leadership fails to act to protect our health and the environment,. Ms. Andy added. Water pollution has become a growing concern for some lawmakers as government oversight of polluters has waned. Senator Barbara Boxer, Democrat of California, in 2007 asked the E.P.A. for data on Americans. exposure to some chemicals in drinking water. The New York Times has compiled and analyzed millions of records from water systems and regulators around the nation, as part of a series of articles about worsening pollution in American waters, and regulators. response. .There is significant reluctance within the E.P.A. and Justice Department to bring actions against municipalities, because there.s a view that they are often cash-strapped, and fines would ultimately be paid by local taxpayers,. said David Uhlmann, who headed the environmental crimes division at the Justice Department until 2007. .But some systems won.t come into compliance unless they are forced to,. added Mr. Uhlmann, who now teaches at the University of Michigan law school. .And sometimes a court order is the only way to get local governments to spend what is needed..
.I proposed drinking water cases, but they got shut down so fast that I.ve pretty much stopped even looking at the violations,. said one longtime E.P.A. enforcement official who, like others, requested anonymity for fear of reprisals. .The top people want big headlines and million-dollar settlements. That.s not drinking-water cases.. It is unclear precisely how many American illnesses are linked to contaminated drinking water. Many of the most dangerous chemicals regulated by the Safe Drinking Water Act have been tied to diseases like cancer that can take years to develop.